The establishment of the Lambda Cold Dark Matter paradigm in Cosmology has brought together physics on very diverse scales, with a mesmerizing variety of observational techniques and a unique theoretical effort. The consistency of this paradigm is today hindered by some tensions, either of internal consistency between datasets of different nature, or of seeming friction between theoretical predictions and observations. Observational and theoretical efforts are currently under way, in order to both understand the possible sources of systematics affecting the data, and to explain these frictions on theoretical grounds. 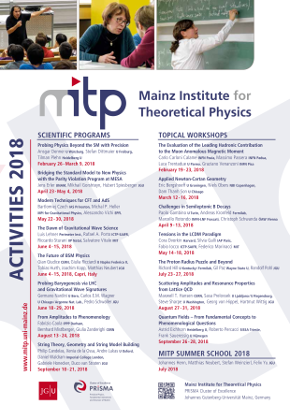 This proposed scientific program aims at bringing together the communities involved in this effort, building a bridge between observers and data analysists, theorists, and simulators, in order to address the following fundamental questions about the tensions in the CDM paradigm: Is the current tension in the determination of Hubble constant by different probes due to new physics, or to systematics? What are the real sources of the inconsistencies between theoretical predictions and observations at the smallest galactic scales? Is it a problem that we are seeing no new physics at LHC? The ideal, two-fold, goal of the topical workshop is that of understanding whether tensions appearing on several scales are only episodical and disconnected from each other – and to which extent they are due to experimental systematics – or if they represent real cracks in the building of the ΛCDM. In the latter case, it remains to be assessed whether they are structural, thus hinting toward a major revision of our vision of the cosmological Universe, or they can be cured with minor modications at different scales, separately.